But what are a set of poor fellows like us to do, living here amongst mountains, and ravines, and torrents, and deep watercourses, and morasses, against none of which the best horse that ever put foot on turf could contend for five minutes? It took me, I must confess, some time before I could get over all the finer tone of my Leicestershire feelings; and I have no doubt that I blushed a perfect scarlet the first time that I doubled up a fox with a rifle-ball; but now, rendered callous by use and necessity, I can do execution upon him without a pang. In Scotland the fox holds the first place among "vermin." I do not think that a mountain-fox would live long before a pack of regular fox-hounds, but in his own country he is well able to take care of himself. He is a handsome powerful fellow ; and in size and strength more like a wolf than a Lowland fox, and well he may be, since his food consists of mutton and lamb, grouse and venison. His stronghold is under some huge cairn, or among the fragments that strew the bottom of some rocky precipice, perhaps three thousand feet above the sea. In those mountain solitudes he does not confine his depredations to the night; I have often encountered him in broad daylight, and through my deer-glass have watched his manner of hunting the ptarmigan, which is not so neat, but appears quite as successful, as the tactics of the cat. By an unobservant eye, the track of a fox is easily mistaken for that of a dog. The print is somewhat rounder, but the chief difference is the superior neatness of the impression and the exactness of the steps, the hind-foot just covering the print of the fore-foot. The fox makes free with a great variety of game, and the demands of his nursery require a plentiful supply. In the hills he lives on lambs, sheep, grouse, and ptarmigan ; in the low country the staple of his prey is rabbits, where these are plentiful; but nothing comes amiss to him, from the field-mouse upwards. The most wary birds, the wood-pigeon and the wild duck, do not escape him, and he destroys a considerable number of the young of the roe. The honey of the wild bee is one of his favourite delicacies; and vermin-trappers have found no bait more effective to lure him than a piece of honey-comb. His nose is very fine, and he detects the taint of human footstep or hand for days after it has been communicated. Several ways are tried for evading his suspicions. Some trappers place three or four traps in a circle, and leave them well covered for some days without any bait; and at the end of that time, when all taint must have left the traps, they place a bait in the centre. Another way is to place the traps in shallow water, and a bait on some bank where he cannot reach it without running a good chance of treading on them. Even when the enemy is in the trap the victory is not won : and if he escapes, whether whole or maimed, after being trapped, he is too well warned ever to be caught again. 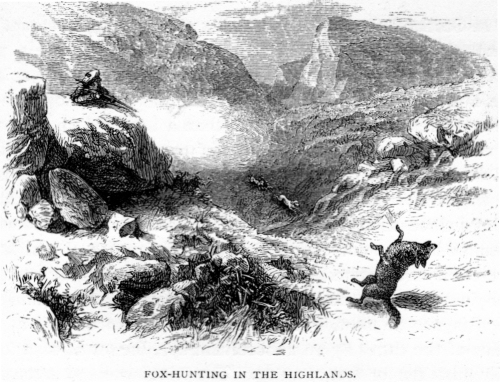 Altogether, trapping has never been very successfully practised against the fox in the Highlands, and the old native practice of "fox-hunting," as the professional mode of killing them is called here, is still much preferred. Of all ways of earning a livelihood, perhaps there is none that requires a greater degree of hardihood and acuteness than the trade of a vermin-killer in the Highlands — meaning by "vermin," not magpies, crows, and "such small deer," but the stronger and wilder carnivorous natives of the mountain and forest — the enemies of the sheep and lambs. In the Highlands he is honoured with the title of "The Fox-hunter" but the Highland fox-hunter leads a very different life, and heads a very different establishment, from him of Leicestershire. When you first come upon him in some wild glen, you are somewhat startled at his appearance and bearing. He is generally a wiry active man, past middle age, slung round with pouches and belts for carrying the implements of his trade; he wears a huge cap of badger-skin, and carries an old-fashioned long-barrelled fowling-piece. At his feet follow two or three couple of strong gaunt slow-hounds, a brace of greyhounds, rough, and with a good dash of the lurcher, and a miscellaneous tail of terriers of every degree. A short time ago, the foxes having made too free with the lambs, the sheep-farmer of the glen summoned the fox-hunter to his assistance, and I joined him with my rifle. Before daylight, the fox-hunter and myself, with two shepherds, and the usual following of dogs, were on the ground, and drew some small hanging birch-woods near the scene of the latest depredations. While the whole pack of dogs were amusing themselves with a marten-cat in the wood, we found a fresh fox-track on the river bank below it, and after considering its direction leisurely, the fox-hunter formed his plans. The hounds were coupled up, and left to the charge of the two shepherds, whilst we started with our guns for a steep corrie, where he expected we could command the passes. It was a good hour and half of a jog-trot, which seemed a familiar pace to my companion. We at length turned off the great glen, and proceeded up a small, rapid, rocky burn tracing it to where it issued through a narrow fissure in the rocks, down which the water ran like a mill-race. Scrambling up to the head of the ravine, we found ourselves in the corrie, a magnificent amphitheatre of precipitous grey rocks. The fox's favourite earth was known to be far up on the cliff, and as only two passes could easily lead to it, we endeavoured to command them both. My station was high up, on a dizzy enough crag, which commanded one of the passes for a considerable way, and sufficiently screened me from all the lower part of the corrie. Having with some difficulty got to my place, and arranged the best vista I could command whilst keeping myself unseen, I had a few minutes to admire the wild scene below me. It was a narrow corrie, with a small clear stream twisting and shining through an endless confusion of rugged grey rocks. I had not been placed many minutes when a deep bay reached me through the clear morning air. I listened with eagerness; and soon heard the whole pack in full cry, though at a great distance, and apparently not coming quite in our direction. While watching, however, the different entries to the corrie, I saw a fox come leisurely down a steep slope of loose stones towards where the fox-hunter was concealed. Presently he stopped, and quietly sitting down, appeared to listen for the dogs; and, not hearing their cry come nearer, he came quietly and leisurely along, till he reached the track where we had crossed the corrie; when, cautiously stopping with his nose to the ground, he changed his careless manner of running to a quick canter, halting now and then, and snuffing the air, to find out where the enemy was concealed. Just then, too, the hounds appeared to have turned to our direction, and another fox came in view, entering the corrie to my right hand at a great pace, and making directly towards me, though still at a mile's distance. The first fox had approached within sixty or seventy yards of the fox-hunter, when I saw a small stream of smoke issue from the rocks, and the fox staggered a little, and then I heard the report of the gun. The foxes both rushed down the hill again, away from us, one evidently wounded; when, the echo of the shot sounding in every direction, first on one side of the corrie, then on another, and then apparently on every side at once, fairly puzzled the poor animals. The wounded fox turned back again, and ran straight towards where the fox-hunter was, while the other came towards me. He was within shot, and I was only waiting till he got to an open bit of ground, over which I saw he must pass, when the hounds appeared in full cry at the mouth of the corrie by which he had entered. Reynard stopped to look; and stretching up his head and neck to do so, gave me a fair shot at about sixty yards off. The next moment he was stretched dead, with my ball through him; while the other, quite bewildered, ran almost between the legs of my fellow-chasseur, and then turned back towards the dogs; who, meeting him full in the face, wounded as he was, soon caught and slew him. In a short time the whole of our troops, dogs, shepherds, and all, were collected; and great were the rejoicings over the fallen foe. I must say, that though our game was ignoble, the novelty of the proceedings, and the wildness and magnificence of the scenery, had kept me both amused and interested. I forget the name of the corrie: it was some unpronounceable Gaelic word, signifying the "Corrie of the Echo."